You don't have films made like this in India. Ashok Mehta's brillance is evident from the first shot in the film itself. The camera tracks on the hard textured surface and stops at Vikram sitting near the crashing waves of the ocean. Arjun Rampal looks immaculate,the best thing that can happen to a debutant actor, great looks and all the space for a staller performance with support cast from the best in the film industry - manisha koirala, nasseruddin shah and Danny Denzongpa. I wondered after watching the film, how about if the script was worked over my Oliver Stone, directed by Davil Lynch and off course cinematography by Ashok Mehta. 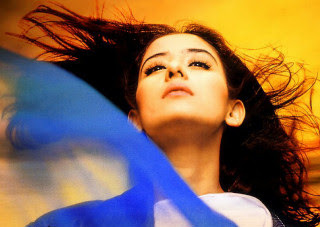 The surrealistic dream sequence of Manisha Koirala is unparalled in Hindi film industry. The allegory and metaphor used in the mountain particularly the constant rock climbing done by Arjun and Manisha in the film and attempts of Arjun to move and roll down a rock down the valley just escapes your imagination and soon enough you realise the statement made by the filmmaker. The story like is full of idealism and the character moulded and played beautifully by Arjun Rampal is an allegory of a idealist who fails to come in terms with reality. You constantly feel guilty of finding yourself on the wrong side of the main protagonist and feel overburdened by the trails of reality in everyday life. Arjun Ramphal plays Vikram Sehgal, a lawyer with the rare quality of empathy whose sole aim in life is to make a difference in this world, where money is the root of all evil. Vikram wants to open up a law firm that deals with helping the poor and needy fight injustice, a place where even the poorest of the poor can find legal representation. He shares this dream with his ladylove Ritika Sanyal (Manisha Koirala) and together, the two unsuccessfully attempt to raise enough money to open their legal offices. The couple becomes disillusioned with the lack of support from all venues, including parents and friends, and immediately begins to search for other forms of income. One day it dawns on Vikram that robbing a bank could end his monetary issues forever, allowing him enough cash to open his office and live happily ever after with Ritika. He shares his plan with Ritika and the two immediately plot to support each other and go through with the robbery. However, a few days prior to the robbery, Ritika develops cold feet and backs out of the plan. Shocked and dismayed at his lover´s betrayal, Vikram decides to go through with the plan on his own, and chaos ensues. Manisha Koirala looks stunning and gives great support to Arjun Rampal, particularly her innocense comes through very clearly. And Ashok Mehta is very clear from the outset, he knows the audience will not understand the film and he continues on that tangent, failing to realise that a little more work on the sequencing and screenplay could have added more flesh to the character and may be the audience could have understood the characters in the film. Arjun Rampal looks like a cardboard cutout of a character, where he shouts and screams and tries his best to make everyone understand what he believes in but still fails, similarly Ashok mehta fails to make you understand what he really wants to say. Keeping aside the brilliance in the camera work, the story line could had been more simplified and closure made more dramatic. Some of the surreal scenes streched for too long, but no matter how complex the plot, you just cant forget the surreal scenes. Perhaps a psychological crime thriller where you travel into the convicts mind like "The cell" looks lacklustre infront of Ashok mehta's brilliance with the film camera. what if om prakash mehra comes up with such an idea and decides to colloborate with Ashok Mehta, I just can't wait to see the film they create together. Moksha, is the most remarkable film ever made in the recent past, only that the brilliance remains in the rushes of the shots but fails to bind together in the form of a film.